Ludwick Marishane is an international award winning business scientist and speaker. He is the MD of Headboy Industries Inc, which is an innovative product-development & commercialisation company best known for their DryBath® product. 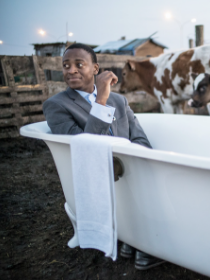 Ludwick is his country’s youngest patent-filer after having invented DryBath® at the age 17. In 2011, he was rated as the best student entrepreneur in the world, and that same year, Google named him as one of the 12 brightest young minds in the world. He holds a Bachelor of Business Science, majoring in Finance & Accounting, from the University of Cape Town in South Africa. In December 2013, the global TIME Magazine named him as one of the 30 people, under 30, who are changing the world…one of only 2 Africans on the list. Forbes Africa named him as one of the Top 30 under 30 Young African Entrepreneurs in 2013 & 2015, and in 2015 he was chosen as one of South Africa’s 21 ICONS for the curation’s youth-focused 3rd edition. He was the only African (and youngest) to address the 1500-person industry-audience at the 2015 Accenture Innovation Conference (on the topic of Reverse Innovation), and has done corporate & academic talks for GIBS, UCT-GSB, Standard Bank, Absa, Discovery, Momentum, VWSA, Accenture, Sanlam, Primedia, Nandos, 2016 Consumer Goods Forum Summit and many others. He speaks with an engagingly relaxed, humorous tone, but is very frank with regards to speaking practically & bluntly on his topics. ONE 250ml bottle of DryBath® lasts for 15 washes. This bottle can last for a month for someone using it 3 times per week! A DryBath® bottle can cut your bath-water needs by up to 50% monthly.